Carrot - 1, finely grated, pureed and then cooked with sugar and 2 tbsp milk. Beetroot - half of a beetroot, finely grated, pureed and then cooked with sugar and 2 tbsp milk. Dates - 4 nos. soaked in water and then make paste with 2 tbsp milk and then cooked. Mix in the pureed carrot (cooked for 5 minutes) with 5 tbsp maida and make a batter like dosa/pancake batter. Keep it aside. Now mix in the pureed beetroot (cooked for 5 minutes)with 5 tbsp maida and make a batter like dosa batter and keep it aside in a separate bowl. Then again mix in pureed dates ( cooked for 5 minutes) with 5 tbsp maida and make dosa batter. Keep it aside separately. Now prepare sweet filling with scrambled egg, coconut, sugar, and cashews. Keep it aside. Beat 1 egg with 2 tbsp milk and sugar, keep it aside. Heat a pan, spread some ghee evenly and pour one ladle of carrot batter. Make two thin dosas/pancakes and keep it aside. 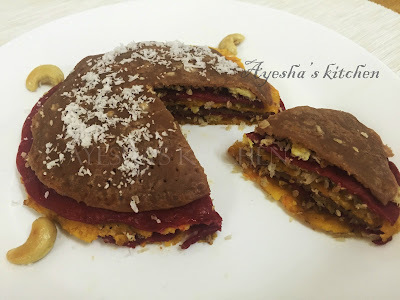 Likewise, make two thin pancakes each with beetroot batter and dates batter. Keep it aside. Heat the pan again and spread the ghee. Make the flame to medium-low. Then take one carrot pancake , coat it with egg batter and place it in the hot pan (same like chattipathiri / stuffed chappathi). Now spread some egg fillings and press it gently. Then take one beetroot pancake coated in egg-milk batter and place it over the carrot pancake and put fillings. Then with dates pancake and continue for all pancakes. Pour the excess egg batter over the layered pancakes and gently press all the ends. Cook in a very low flame for five minutes. Then cook the other side by flipping the layered pancake to another pan. Cook for 5 minutes. Cut the sides to make a round shaped layered pancake and decorate with desiccated coconut.